There are two new papers out on the early colonization of the Americas, one in Science and one in Nature. The Science paper claims that all Amerindians stem from a single Siberian population that moved into Beringia about 23,000 years ago and entered America about 15,000 years ago, splitting into northern and southern branches about 13,000 years ago. They also found a touch of Australo-Melanesian ancestry among some, not all, living Amerindians – they saw it in Aleuts and the Surui ( Amazonian Indians). They concluded that this ancestry must have arrived well after the initial colonization of the New World: “The widely scattered and differential affinity of Native Americans to the Australo-Melanesians, ranging from a strong signal in the Surui to much weaker signal in northern Amerindians such as Ojibwa, points to this gene flow occurring after the initial peopling by Native American ancestors.” In much the same way, the fact that you see widely different amount of Bushman admixture in Bantu groups in southern Africa ( a lot in the Xhosa, almost none in some other groups) suggests that the Bushmen arrived after the Bantu, except that it doesn’t of course. The Nature paper concentrates on the Australo-Melanesian story: they see it mainly in the Amazon Basin, 1-2%. The closest extant population is the Onge, pygmies of the Andaman Islands, but you see this anomalous relatedness in the Papuans, Australian Aborigines, Mamanwa (Philippine Negritos), and at lower levels in a number of groups in South Asia. In many Amerindian groups this component is much weaker or nonexistent. The authors of the Nature paper believe that this admixture most likely happened before the settlement of the Americas, but they aren’t sure: the linkage disequilibrium says some time between 40,000 and 4,000 years ago, probably after the Ancient North Eurasians mixed into the Amerindians. They talk about population Y, a separate movement into the Americas by a population that had probably already acquired this Australo-Melanesian component. The background fact is that the earliest skeletons, especially in Brazil, look like Australo-Melanesians. Long skulls. If population Y were almost entirely standard Amerindian, with only a smidgen of Australo-Melanesian ancestry, they would have looked like Amerindians. On the other hand, if the original settlers of the Americas were mostly or entirely Australo-Melanesian (or more exactly something vaguely related to those existing populations) they would have those long, narrow skulls. This is the Paleoamerican model – and if true, it means that an Onge-like population arrived first, and that the incoming Amerinds almost completely wiped out them out later, with here and there a bit of admixture. As I understand the law, this would mean that we have to build little casinos inside the existing casinos. For some small establishments, this might mean designating the proceeds of a single slot machine to various Amazonian tribes, or possibly to the Onge as next of kin. So who the hell are the Na Dene? Why are they so different and look like they arrived a couple thousand years ago? My Na Dene kids are often mistaken for Korean. They had to arrive later. Another recent study found contrary to the Science paper that the Na Dene did arrive much more recently and are admixed with founder native Americans. Given archaeology and language, I doubt the new Science paper conclusion. The migration of Nadene people into the American Southwest is very recent. Southern Athabaskan languages are very similar indicating recent divergence from a common source. Recent means within the last thousand years or so. The predominant geographical location of Nadene languages in Western Canada and Alaska together with their great difference from other Amerindian languages certainly suggests that they are recent migrants from Siberia. Also there is the opinion of many linguists that Nadene languages are related to Ket a language spoken by a small tribe in Western Siberia. Oh and my guess, the Onge type pop were here first then wound up on the Fish and Game regs for open season on varmints when the Barbeque folks arrived. Maybe they even wound up on the grill. They’re later, like the Eskimos. There’s apparently even a language link with the Ket. My best friend (a Northern Athabascan) looks just like one of the pictures of the Ket in wikipedia. All these groups did not know farming, weaving, skin tanning, pottery and basket making. The fisherman groups did not know the fishing hook and nets, while the Onas, inhabiting an island surrounded by fish-rich waters, did not fish and nor even did they swim. Those people, because of the large feet, gave the name of that area (“pata” means “leg” in Spanish). They were tall, men’s height varying between 1.7 to 1.8 m (5.6 to 6 ft), with massive bodies, wide faces, large prominent noses and straight hair. Instead, the Yahgans and Alacalufs were very short (male average height was of 1.55 m or 5 ft 2 in), with feeble bodies. The head had a receding forehead, a very wide nose and wavy hair. @Toad: Thanks for the interesting source. Original inhabitants driven to marginal territory, like the Bushmen? Considering there is one Yahgan who is full-blooded still surviving, and a number of people of partial Yahgan ancestry shouldn’t it be easy to determine if the population has any Austro-Melanesian admixture? FWIW, the last Yaghan doesn’t look different from any older Amerind woman to me. Of course, you wouldn’t presume them to look too different if you’re talking about a few percent Austro-Melanesian ancestry. Fuegians did not swim because the ocean is very cold (5 to 7 Celsius) and with strong currents. BTW, Polinesians peopled the Isla de Pascuas facing Chile, and they also reached the continent. They must have carried Melanesian genes too. @gcochran: So, if I understand things correctly, the first settlers of America were Australo-Melanesian groups that arrived, possibly, 50KYA+ ?? Probably not that long ago. So if you had to guess, where did they come thru – Beringia I assume? So they were subsequently not only almost completed displaced in the Americas, but also completely displaced in Beringia and the Asian mainland? Also, Kennewick Man is often held up as proof that ancient skull morphology does not equal ancestry- you don’t think that could be the case with the ancient Amazonian long skulls? They most certainly do. Fuegans, Botocudos, Pericues are all identified as Dolichocephalic, relic, or Paleo-Indian populations. They have all been tested and found to be Standard Native Americans. Naia and Kenniwick Man with their narrow skulls just confirm this. Why is it so hard for people to admit that Native Americans are the first people of their homelands. Besides that it would be impossible for a previous Melanesian population to be completely wiped out by an invading people without leaving larger genetic imprint on the invading people, the group coming into the Americas would be no larger than small family groups with a small amount of woman, not warriors, and they would need the help of the population to survive in a new territory, eventually they would need woman, I doubt they would of massacred any of the woman and they wouldn’t of been in any condition to massacred all the men. In the Americas, There is no precedent in the world were the invading people did not breed with the invaded, hell, we even bred with the Neanderthal and Denisovian, it just doesn’t happen. I can easily imagine that Amerindians were the fist settlers of the Americas. I can also imagine that they were not. I contain multitudes. Obviously the Amerindians did interbreed with this kindof-Melanesian population, just not very much. Something like a couple of per cent – and only in South America. Could a new population replace the old while only admixing to the extent of a couple of percent, or less? Sure: we now know that it has happened several times. For example, the Inuit either didn’t admix with the Paleo-Eskimos that preceded them, or did so to a such a small extent that it eludes detection. Looking less likely than they did a decade ago. Look where the original amerind population came from, Beringia 15,000 to 23,000 years ago. One of the coldest places on earth humans have ever successfully survived. Look where a signature of these Andaman-like people shows up at a rate of 1 to 2%. The amazon basin, affectionately known as green hell, because of it’s unrelenting heat. Funny thing is these amazonian tribes have some pretty nifty adaptations to living in the tropics, so do a whole lot of latinos I have tried to work along side in the hot summertime. Did all these mutations occur in the last 13000 years, did they magically survive for 8000 years in Beringia, or did the Skipper and Gilligan bring them from another hot place in the world. I vote for the Skipper and Gilligan as a source of at least some of these genetic adaptations to living in the heat. The cool thing is this can be tested and I’ll bet that brilliant bunch headed up by Reich are probably doing that right now. Meanwhile, this casino inside of a casino idea. Give those Amazonian tribes the loot from sports gambling. If you did they would make those Saudi oil princes look like third world street beggars. We may very well be plugging our cars into our tesla powerwall pretty soon but will never ever give up making bad bets on our favorite NFL team. If these Andaman-like people did carry highly advantageous genes for living in a hotter climate it wouldn’t take very many of them to make it all the way across the Pacific for their genes to spread far and wide. When did they get here? I could speculate but why bother, the days of ego driven theories are over, just wait for the next Reich paper. I don’t see how Cochran or anybody can write a book on these developments. By the time it reached publication it would be out of date. If they came straight across the Pacific, they left little trace in any of the places in distant Oceania where Polynesians appear to have been the first human presence. I thought I had read before that equatorial Amerinds are the only tropical group which doesn’t show adaptation of body shape to the tropics. That they were still fundamentally built like Siberians – with stocky bodies, short limbs, and a lower surface area ratio. Whether the Austro-Melanesians came first or second, one would expect that traits which adapted them well for warm climates would be preferentially selected by Amazonians. That is presuming, however, that they were actually tropical adapted. If we’re talking about very old admixture, it may well be there was some Negtito-like population which lived somewhere in temperate maritime East Asia (say Japan) and leapfrogged past the Beringians entirely. Seems like compared to the Old World, in some ways yes, in others no: http://gradworks.umi.com/32/95/3295793.html a >1000 page dissertation on this subject (well, most of the 1000 is data and references). How, then, might the general morphological patterns of the Americas be described? Throughout the Holocene, prior to European colonization, humans in the Americas display a considerable amount of diversity in body shape, limb proportions, size, and the relative strength of the limbs. On the whole, they have remained wide-bodied relative to populations in similar environments in Europe and Africa, probably as a result of constraint on the variation of pelvic shape in relation to a number of factors, including but not limited to the mechanics of walking, the physiology related to the birth canal, and cultural buffering. I skipped to page 420-423 (448 in the file) with compares some Old World samples (Africa, North Africa, Europe) with a wide range of the New World. Intralimb indexes demonstrate a fairly clinal pattern, with more of a “warm climate” pattern among Native Americans from climates generally warmer than Europe, compared to Europeans (some instances warm climate Native Americans are comparable to Africans). These are the brachial (radius – forearm – to humerus – upper arm – ratio) and crural (lower leg to thigh ratio) indices. Particularly crural index. The relative torso height (more or less legs relative to height overall) and pelvic breadth show what seems like a cooler adapted pattern, even in Native Americans from warmer climates. However, even the cool climate Native Americans were quite comparable to the North and South European sample in the relative torso height, so “arctic” on these are perhaps an overstatement. There may be less or slower selection on these two factors (e.g. pelvic breadth doesn’t really matter very much), or it may be that something else happens with these, like there other adaptations that maintain a particular kind of pelvic variation even once a climatic pressure is removed. Is pelvic breadth related to skull size? At some point I realized that “indigenous” means “the people who were living here when the first literate people arrived” not “the first people to live here”. Icelanders may be one of the few truly “indigenous” populations in the world since there doesn’t seem to be any evidence that any other people ever lived there. There are some pacific islands in the same, er boat. On the contrary, the Vikings alluded to monks who were there before them, presumably from Scotland or Ireland. NZ and Madagascar, plus all the little Pacific islands, are surely the best candidates? Yes. On Guam which was one of the first remote Pacific islands to be inhabited there is archaeological evidence of human settlement going back to 1000 BC and the present Chamorro population is presumably descended from them as there is no evidence of the original settlers ever being displaced. That video of that congressman was one of the funniest things I ever saw. I always wondered why his aides didn’t hustle him off. The defense department guy testifying should have received the highest awards and medals for not rolling around on the floor laughing himself to death. Are monks truly a population, since they don’t reproduce? The expression “community” is routinely used of monks. Are women over fifty truly a population ….? The Native Americans would considered Indigenous, because there is zero evidence that no other people live there before the Founded the two continents. Iceland had Irish monks living there before The immigrants from Norway showed up, and the Aussie Aboriginals were there 40,000 years before anyone else, there were no predecessors before them. An April 2015 preprint on Denisovan admixture in East Eurasians and Native Americans also deserves consideration along with today’s two papers. 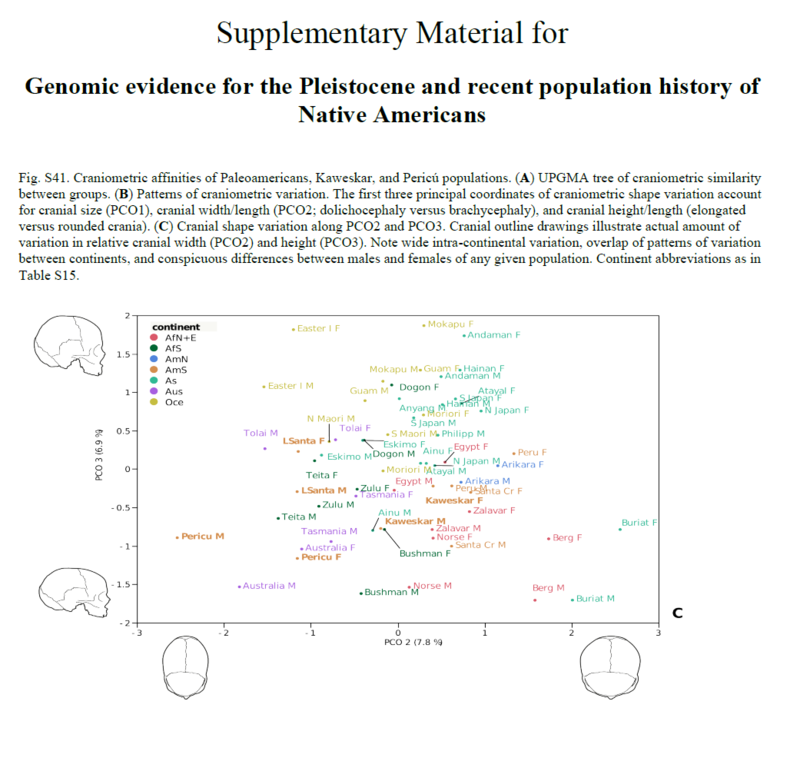 A couple of the findings of the Science paper contradict prior solid research in the field of Native American genetics, so it deserves skepticism. Present day Andamanese are distinguished by short, broad crania http://journals.plos.org/plosone/article?id=10.1371/journal.pone.0024024 (reminds one of Amerinds in the brain topography link). When results concern trace amounts, and seem very odd, I’d first look at the data: are they all from modern populations, or is there substantial ancient DNA in the suite analysed? Is there enough data to support the conclusions? Secondly I’d look at the measurement/calculation methods with a critical eye. For example, could the conclusions be a consequence of whatever modelling methods were brought to bear? Thirdly, I’d wait for more evidence and analysis from different research groups. If evidence piles up pointing in the same direction, then I’d be persuaded. Then the questions of who/where/when become fascinating. Unless the whole archaeology and anthropology of the Pacific islands is wrong, the Australo-Melanesians can’t have island-hopped to the Americas across the wide Pacific. So where then? The far north, presumably. Is there any other evidence for Australo-Melanesian-like people there? Or more accurately, I suppose, Australo-Melanesian-descended people. Wot larks. “indigenous” means “the people who were living here when the first literate people arrived”: that’s about the size of it – who was living there at discovery, where “discovery” implies that the news is bruited about the rest of the literate world. I respect your healthy skepticism. We have been told a lot of nonsense regarding the first peopling of the Americas in the past. David Reich is quoted in the New York Times as saying his team had delved far deeper into it’s analysis of the Australasian trace and is quoted as saying unequivalently “We have overwhelming evidence of two founding populations in the Americas.” That is still not proof but it is a good start. “the Australo-Melanesians can’t have island-hopped to the Americas across the wide Pacific”: except, I should have added, the Polynesians who reached Easter Island and probably went on to touch the S American mainland (as was alluded to above). Could their late arrival have any bearing, though, on the matter under discussion? If it happened that way, it would have to have done so in a way that didn’t look like admixture in the model. You’d need a very small number of contacts with Polynesians to insert advantageous genes into a population and then have the frequencies of them rapidly rise due to selective advantage in a manner that was indistinguishable using their methods (other than direct comparison of haplogroups to others known to exist) from random selective fitness enhancing mutations that arose locally. Carrying that thought a bit further, the more that the similarities involve selectively neutral loci, the less likely a recent arrival is, while the more functional the similarities are (or proximate to functional loci) the more likely a recent arrival scenario is. Also, one could imagine that there was simply a fairly low level of Paleo-Asian admixture in the entire Berginian population, which mostly disappeared due to random drift outside of the Amazon, but was amplified due to selective advantage in Amazonian populations. The selective advantage wouldn’t have to be very big, nor would the original percentage of Paleo-Asian admixture, given that it has 13,000 years to rise in frequency where it is advantageous, or drift out where it is not advantangeous. What about a Southern route? In a glacial maximum, there could be an ice route from New Zealand to Tierra del Fuego, and the Melanesians had boats, right? NZ was unpopulated at the last Glacial Maximum. The Maoris arrived ca 1250 – 1300 AD. What about Tasmania/ Sahulland? It was evidently populated as 40,000 BP, right? By the time of white contact the Tasmanians didn’t use boats or even logs. If they wanted to get to the other side of a bay they walked along the coast. They must be the least likely candidates for sailing thousands of miles that you could ever come up with. The times they are a’ changing- as Greg has argued various times, there are more potential mechanisms for a population to get dumber than smarter. Fair point. The whites who first wrote about the Tasmanians could scarcely believe how backward they were, and that’s by the standards of the mainland Abos. Many Tasmanian aboriginal tribes had a kind of traditional canoe made from wood and grasses. That’s interesting. Does it mean that only some coastal tribes couldn’t cross a bay, rather than all of them? Their canoes were used for shorter distances than crossing the bay, such as reaching the small islands around Tasmania(e.g. the cape barren islands, where they sometimes hunted). They probably lost the technology of longer distance sea travel after becoming isolated. This looks like around 500 miles between Tasmania and the sea ice at the Last Glacial maximum ( http://www.researchgate.net/profile/Xavier_Crosta/publication/223645807_Sea-surface_temperature_and_sea_ice_distribution_of_the_Southern_Ocean_at_the_EPILOG_Last_Glacial_Maximuma_circum-Antarctic_view_based_on_siliceous_microfossil_records/links/02e7e51cc0b5db0043000000.pdf on page 886). There could be variation from year to year, I guess, where a fishing population suddenly might find it not so far to go to the sea ice. Also, according to this ( http://www.ncbi.nlm.nih.gov/pubmed/17841714 ) there was extensive northward movement of icebergs during the last ice age. I don’t know anything about how Inuits or similar people hunt and fish using sea ice– do they just make day trips onto the ice, then come back to the mainland to sleep? Or can they stay on sea ice for periods of time, ranging over an area to find new fishing and hunting grounds? The latter seems like it would support the idea of a wide ranging population, if a group ended up on the Antarctic sea ice to begin with. There were a couple of cases of Eskimos ending up in Scottish waters in the Little Ice Age: there’s even a kayak in a museum in Aberdeen. But 500 miles from Tassie is a long stretch for a people who didn’t, as far as anyone knows, have any sort of sea-faring tradition. Still, it’s one of those fascinating suggestions that’s unfalsifiable because any evidence would long since have vanished. My money is on a northern route involving people with a bit of shared descent. Is it possible to extract DNA from these long-skulled, ancient Brazilian skeletons? Obviously it’s from a hot and wet climate, but that recent paper about usable DNA surviving in the petrous bone makes me wonder. The results are of course surprising but at the same time I’m not too shocked. It’s clear that these early Austro-Melanesian-related groups got around. Besides the coastal route going south or the ice route (interesting proposition), is it not feasible that a small group made the long journey by raft across the Pacific? All it would take is a small founder effect to see these numbers, right? People have tried. No success, and the megafauna in the caves & rock shelters also failed. Maybe they will try again harder. But why would people launch themselves into the unknown on rafts? Must we assume them to be bloody fools? If the alternative was massacre I’d guess the losing side in a conflict would be the most likely candidate for this kind of voyage. That kind of scenario makes sense for a short hop with a destination in sight on a clear day, like the trip over water to the island of Flores. But, a long range trip by raft with a sufficiently large founding population seems very implausible. Eric the Red left Iceland with 25 ships and arrived at Greenland with 15. Catamaraners willing to accept similar attrition might have swung out from West Africa to circle with the winds on a long reach to Brazil and come back to the Cape. There are a number of scientific inquiry methods to trace signs of who got where when. It wasn’t very long ago that looking at stones and bones was king of the hill. They now have to begrudgingly share the top spot with this new rapidly expanding field of paleopopulation genetics. We also have some highly useful information coming from the study of the common roots of various present day languages and our successful killer footprint. It is the last one I plan on discussing here. Long before the last wave of stone cold human killers and their hunting dogs moved from continent to continent, island to island, depopulating the countryside of many large and tasty species there was a similar detectable wave of hominid killers moving along the coasts. John Hawks has talked about turtles winking out of existence in parts of south east Asia 800,000, presumably because that is the time that hominids got there. That won’t apply to these people but the method could be used. Are there studies of when easily exploited species disappeared along the Pacific coast of the Americas? The world would have been their oyster for the first arrivers. The defensive strategy of turtles, mollusks, and beach lounging seals wouldn’t have worked very well against the first wave of rock bashing humans. It has long been a mainstream belief that humans could not have arrived much before 15,000 years ago in the Americas because their population would have exploded and the evidence of their rock tools would be everywhere. It is a pretty solid argument but I recently suggested one possible alternative. If small groups of humans had by a small miracle survived a windblown trip across the Pacific they may have been severely hampered by inbreeding in the following generations. Who knows, I certainly don’t. The problem is that that the coast wasn’t the coast then it was something like a hundred miles to the west. Salmon type species move in fast when they get the chance and change fast when isolated. They quickly become an easy and reliable source of food. There could have been whole villages on the coast we’ll never find that were whalers or fishers. Even using primitive methods you can support hundreds or even thousands. I forgot to add there is nearly no reason at all for a costal group to go very far inland. Fur hunting? Or would there be enough fur-bearing animals near the beach? Something occurred to me. If you had a small founding pop and were coastal harvesters there is little reason to go far from the beach river mouth. But if you land in the Pacific subduction zone evidence you existed would be severely scraped away every so often. Not to mention whole tribes were swept away in historical times. To the untrained eye looking through National Geographic, the Amazonian Indians somehow just seem different than other Indians. Some of that may be convergent evolution of adaptive phenotypes during the last 13,000 years with no outside contact. Re: paleoamericans, physical anthropologist Mark Hubbe has done work on these guys skull shape. Turns out when a large group of them is put together, they cluster together with Easter Islanders, separate from Australians and Papuans. (Samoans and Tongans are modeled as 2/3 East Asian, 1/3 New Guinean). Something to consider when we weigh up whether the paleoamericans were a population with predominantly East Asian ancestry, even if we discount the morphological changes between Kennewick Man and genetically essentially Kennewick like recent people (which discounting is likely not very smart to do, itself). How do we explain some of the Cali tribes and the Easter Island people without looking at extensive contact at least on a local level with Polynesians? And if there was contact why didn’t succeed beyond chickens and sweet potatoes. Sweet potatoes have got to be a part of the puzzle. The Easter Island people at first contact were Polynesians. Presumably they are now intermixed. It’s assumed that they went on to touch on South America and thence spread sweet potatoes around the Polynesian world. Could Polynesians, e.g. from Hawaii, have touched on North America? Dunno. I think that deserves a wow. I know it many thousands of years later and well below the normal level of discussion here anyway, but, what is up with the Olmec heads? They certainly look Polynesian. My understanding of the rationale why equatorial Amerinds did not become as dark as people in the tropics in the Old World was basically that the genes for dark skin were winnowed out of the genepool. It’s much easier, after all, to have a gene for pigmentation mutate to be inoperative than it is for an inoperative gene to mutate to function correctly again. The Austro-Melanesian ancestry throws a spanner in the works however. If Austro-Melanesians came to the Americas relatively pure – either prior to the Amerinds or afterwards – one would expect that in the tropical Americas their genes for pigmentation would be be highly selected for, even if their overall contribution to the genome was small. Yet of course, Amazonian Indians aren’t even particularly dark brown. What gives? I can see two ways around this conundrum. First, it may be that the Austro-Melanesian population wasn’t particularly dark skinned to begin with. Maybe they were remnants of a now-extinct population from Japan or somewhere in that vicinity. Second, the first round of admixture may have happened in/around Beringia, loitering in the north long enough for the gene variants for dark skin to be purged. Rainforests are actually quite dim, due to the thick canopy. This may be true, but it’s not as if Old World forest dwellers (e.g., Pygmies, Negritos) are not lighter skinned than those who live in open grasslands. Discounting the Neolithic migration into South and Southeast Asia, it seems like everyone in the Old World tropics originally had skin as dark as Sub-Saharan Africans. Still, it may be the case that dark skin wasn’t really advantageous in dense forest, but neither was it disadvantageous – it was just kept because the ancestors lived in open areas before migrating into the deep forest, which required certain cultural adaptations. Still, clearly the Austro-Melanesian didn’t just materialize in the Amazon. They must have landed somewhere on the Pacific Coast, where there was no dense forest. Also, depending upon when they came into the Amazon basin, it would have been not dense rainforest, but mosaic savanna. So dark skin should have adaptive to some groups through the area they penetrated. Dark skin in the jungle shadows might have been advantageous to hunters stalking prey. I think it is highly unlikely that a full blooded Austro-Melanesian migrating directly to the Amazon is the source of this blip. Keep in mind, the blip is 2% ancestry in basically one small founding population after a series of serial founder events. And, equally important, it isn’t really Austro-Melanesian. It lacks Denisovan ancestry and also has affinity to the Andamanese. We are likely talking about a generic mainland Asian Paleo-Asian ancestry component in one small structured subcomponent of the founding population of the Americas. Perhaps one extended family that traveled together as a tribe or band of a couple dozen adults and a census population of perhaps 50, who travels down the Pacific coast and followed the tribal chief into the interior. For example, maybe that tribe’s Paleo-Asian ancestry is traceable to a lone 1/4 Paleo-Asian 3/4 Siberian kayaker who ends up in a Beringian village after a storm shortly before the founding population of South America starts the migration down the Pacific coast and marries into the family (and has only daughters, so he leaves no Y-DNA trace). Since this tribe is at the vanguard of the migration, the population stays genetically isolated for the several generations during which they move South, with lots of cousin marriage, that brings the Paleo-Asian component to fixation at 1%-2% en route. Eventually they reach the Amazon, and the Paleo-Asian percentage may increase a bit due to Founder effects and genetic drift and some slight selective advantage of some Paleo-Asian traits. Perhaps our loan kayaker had a grandmother who married into his family from some relict Paleo-Asian village in the Altai 14,000 years ago. I also think it is more likely that the population that settled the Amazon probably arrived via Columbia rather than Peru, perhaps making their way up the Magdalena River basin, across the “continental divide” from the Caribbean watershed to the Amazonian Atlantic Ocean watershed (a short hop away at the source of the Magdalena River) and then down a tributary of the Amazon from there. Linguistic and genetic clusters in South America tend to favor that kind of route over a direct climb up and over the Andes and La Montana from Peru. One of the important points here would be finding out what skin colour variants the ancient samples like Anzick and Kennewick actually carried. That will take genetics work on probably Malagasy, Polynesians and admixed Native American-African populations that currently isn’t there. In Europe, it looks like a lot of the lighter skin variants hadn’t even swept by the Mesolithic (or some by the Early Neolithic), and we don’t have a lot of evidence the main WHG population was lighter skinned than the darker skinned among South Asia, at the moment. Yeah. The information on WHG shows there is not some universal selection towards lighter skin in high latitudes, at least among hunter gatherers. We should have realized this already, honestly, considering Native Australians were plenty dark all the way to Tasmania, even though at those latitudes light olive skin tone would be more expected based upon total solar flux. Honestly though, I think this strengthens the idea that the common ancestors of East Asians and (the non Ancient North Eurasian component of) Native Americans were both fairly pale. After all, if lighter skin doesn’t actually have selective advantage in high latitudes, it’s easier to explain away as due to random drift once than it is twice. Well, I’m pretty sure the variants swept, whatever they are, rather than random drift. We just don’t know what they are yet, or when East Asians and Native Americans started having them. If they’re the same in EA and NA, they should have (for parsimony) been present at some frequency in common ancestors of EA and NA. “The Malagash is a Malay, and in their catamarans the Malays have dared both East and West. Aye, the feller that has the catamaran is the Viking of the South and the water’s his element. Why’re the totem poles in Mexico same as those in Madagascar? Why is their hair and features the same? Because they are the same. Get a globe, Ma’am, and see if the Malays weren’t aptly situated for adventure east of west. And with such a gift of nature as the catamaran, safe as a gull and swift as an arrow, whose to stop him from overtaking Africa in his wanderings? He settles in Madagascar like birds on an islet–what next but to set his catamaran round the Cape and up the old Ivory. How else came that old ruin [visited by Horn on the Ivory Coast] that has the looks of Zimbabwe about it? Bonded stones same as Zimbabwe. Aye. “..ruins in Madagascar? Bonded stones again … I’ve seen him a bit closer than that. A poor feller we found in those old workings in Rhodesia. Three yards to the left and he’d have found a regular Bank of England. More gold than quartz. Most accomplished prospector, the Malagassy. He was sure on the right vein when the great Onlooker said ‘Thus far and no furthur’ and niched him up there like a saint in the wall. Long black hair touching the shoulders-fine skull with a forehead clever as a white man’s, just like the dead I’ve seen in Madagascar. The wealthy families take out their dead for an outing once a year. Mummied and dressed in imbalmments. Aye, I’ve often met them supporting the corpse between them and telling it all the news. All a question of habit. That Malagash? He fell all to pieces when we touched him. There was his batte’ [‘Miner’s wooden dish for washing gold’ Horn’s editor] there too. It had been cracked and patched up with raffia hemp -sort of linen- the same as they’d mend a batte in Madagascar to-day. “Aye, the Malays beat Alexander. Look at the Sioux Indians over in California. The Incas in Peru. Malays, I’m telling you. Look at their totems–that symbol o’ three birds same in Madagascar as in Mexico and the same writing. When Dr Karl Peters [Carl Peters in Wiki] pored over it and in the end couldn’t make it out he went melancholy. ‘Twas on his mind. But they’d have done nothing without that craft of genius styled catamaran. Ivory Coast to Brazil is with the wind and current, standard sailing ship route. Wonder where Carl or Karl Peters’s notes went? Gavin Menzies 1421, p 104, mentions a stone on the Cape Verde Islands with old letters- he asked the Bank of India what alphabet: ‘It looks like Malayam’. A friend of mine used this study (http://archpedi.jamanetwork.com/article.aspx?articleid=2381542) as an argument against potential (genetically-caused) race differences in average intelligence. Is there anything wrong with the study/how he’s interpreting it, or is he simply right after all? The idea that anything that happens after baseline is due to socioenvironmental forces while the influence of genetics is limited to what happened before baseline is clearly false. Genetics moderates cognitive development over the entire life course, and most especially throughout childhood and adolescence. The fact that we can observe correlates of brain development in socioenvironmental characteristics just means that different types of people are in different circumstances in our society– it doesn’t in itself mean anything about those characteristics causing different types of brain development. Indeed … one of the more striking findings in this area is that the heritability of IQ increases as children get older, which is quite difficult to explain for those who would like to believe that shared environment must somehow be really important. Not very interesting IMHO. They assume from the beginning that the brain structural differences were caused by poverty. One could as easily argue that poverty was caused by brain differences. What effect could this “poverty” have on brain development? Childhood malnourishment could have an effect, but that doesn’t apply here. (the bolded LaSanta are also claimed ancient paleoamericans). 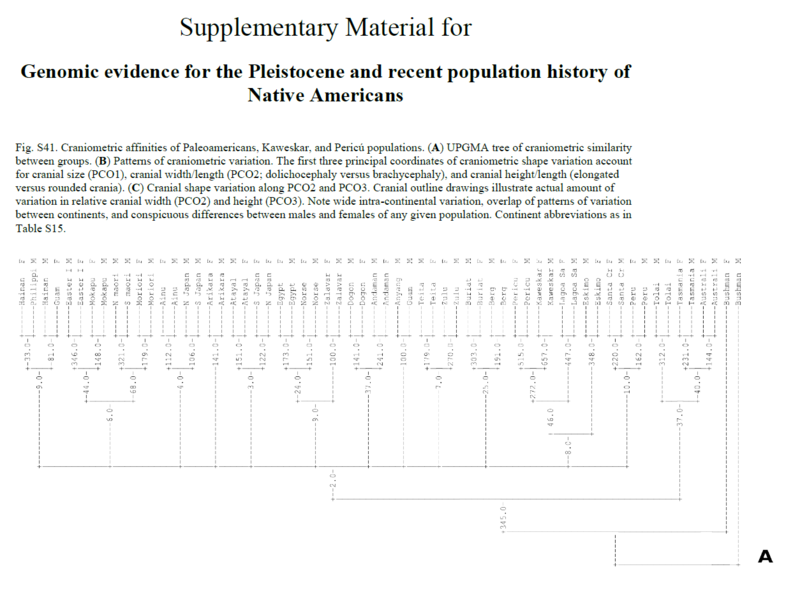 So it seems like from their results that there is clustering of “paleo-americans” with Australasians, if length and breadth (and correlated shape variation) are heavily weighted, but not otherwise in other form factors. By the way, note in the PCA how close the Eskimo sample are to both the LaSanta “paleoamericans” and the African Dogon – intermediately high vaults, which are relatively narrow. Similar shape, probably some size difference. This is a noted contrast in phys anthropology (compare Buriats with totally different cranial shape – very low vault, like Europeans tend to have, and a very broad skull). another point: the inferred Population Y contribution even to Suruí looks quite low. it’s conceivable that the same signal exists (maybe in attenuated form) in the Pericú but was beyond the limits of resolution (low-coverage ancient samples). Raghavan et al. are much less clear on what they should be looking for hence their unconvincing attempts to portray this a late influx. So at least three migrations four if you count Eskimoes. So what’s the reason to try and keep the number down? Politics aside, I like the low migration models because it fits nicely with the collapsed diversity in Native Americans (e.g. HLA, genome wide FST). More and more substantial migrations by genetically differentiated people, that’s harder to see working (you would expect a situation more like Europe or East Asia where a melange of prehistoric peoples have kept diversity relatively higher). The Polynesians – especially the Hawaiians have Myths and Legends about the Menehune (also referred to as Manahune) who are short dark skinned people (Negrito – Negrito like people). Even the ‘aboriginal’ Taiwanese (especially the Saisyiat and the Paiwan tribes) have myths and legends about short dark skinned people (Negrito) living side by side untill recent history. The aboriginal Saisyiat called them ‘Ta’ay’ and they hold ceremonies to commemorate the Ta’ay (short black people) in a festival called ‘Pasta’ay’. Taiwan is said to be the homeland of ‘Austronesians’ who are the ancestors of Polynesians. Some Negrito’s (or perhaps mixed Negrito’s and aboriginal Taiwanese) have sailed the Kuroshio current and reached the Aleutian Islands from where they spread to the west-coast of mainland North America. Plausible, although that far back, paddled is more likely than sailed. Perhaps you’re right about paddling; but we don’t know who (and how) migrated to Mainland North America (MNA) first. The Saisiyat (Taiwanese aborigines) say the Ta’ai (short dark skinned people / Negrito) were living in the same land – territory. If the Ta’ai (unmixed DNA) migrated to MNA first between 25.000 – 10.000 years ago; than yes they would have paddled their canoes (if they had such skills). If the Ta’ai (Either unmixed or admixed DNA) migrated to MNA later after 10.000 (between 6.000 – 4000 years ago = the Austronesian expension into the Pacific) years ago; there’s a chance they sailed along with Austronesians (Taiwanese aborigines) who would have superior canoes and canoe skills. The Ainu aborigines on the islands of Hokkaido (Northern Japan) also have Myths / Legends (traditions) of an ancient race of short (little) people. They call them ‘Koropokkuru’ also spelled as: Kor-pok-un-kur, Koro-pok-guru and Koro Pokunguru. They are also sometimes referred to as Tsuchigumo. Taking into account that the DNA research on the origins and migration to mainland America also states that some Amerindians are linked to Mamanwa (Philippines Negrito); you can see an upward migration from south to north; in other words; atleast from the Philippines to Taiwan towards Japan (Hokkaido island). This would in my opinion make the Kuroshio current migration-route more plausible atleast for the Negrito DNA link. Random question: do any of you know of data on the IQs of Jewish children adopted at birth by non-Jewish parents? The Polynesians (Hawaiians – Tahitians) have myths and legends about short dark skinned people they call Menehune (also Manahune). The aboriginal Taiwanese (especially the Saisiyat also spelled Saisiat and Paiwan tribes) have myths and legends about short dark skinned people they call Ta’ay also spelled Ta’ai. The Saisiyat tribe have ceremonies commemorating the short dark skinned people (Ta’ai) in a festival they call Pasta’ai. The aboriginal Taiwanese are referred to as Austronesians and are beliefed to be the ancestors of the Polynesians. The Ta’ai (unmixed or mixed with Austronesians) could have sailed along the Kuroshio current made a landfall on the Aleutian islands before sailing to the west coast of mainland North America. In this article posted on July 22, 2015 – at dna-explained.com; it states that Aleutian islanders, Surui (Brazil) and Athabascans are closer to Australo-Melanesians compared to other Native Americans. The Athabascan natives live directly east of the Aleutian islands / region. Their neighbouring natives (nations) Cree, Ojibwa / Chippewa, Algonquian (Anishinaabe) have myths and legends of little (short) people. Were those Little (Short) People actually Negrito (Negrito like people)? Maybe it’s too far fetched; yet one could see the resemblance in names these nations (natives / tribes) give these mythical / legendary little people. The natives around here call them “stick Indians”. They can’t talk just in whistles but can mimic speech to lure unsuspecting children. They can’t hunt properly preferring to scavange along the tide line, pick berries, or will take food offered if you whistle they assume you are offering. They are small of stature and called stick indians because they can’t make proper stone tools. I have found this ‘unconfirmed’ story on the so called “Stick Indians” at Wikipedia. Stories and religious beliefs about “Little People” are common to many if not most Native American tribes in the West. Some tribes (such as the Umatilla of Oregon) referred to them as the “Stick Indians,” while the Nez Perce called them Itśte-ya-ha. In 1804, the Lewis and Clark Expedition stayed for a time with a band of Wičhíyena Sioux on the Vermillion River in modern-day South Dakota. On August 25, Meriwether Lewis, William Clark, and 10 other men traveled about 9 miles (14 km) north of the river’s junction with the Missouri River to see the “mountain of the Little People”. Lewis wrote in his journal that the Little People were “deavals” (devils) with very large heads, about 18 inches (46 cm) high, and very alert to any intrusions into their territory. The Sioux said that the devils carried sharp arrows which could strike at a very long distance, and that they killed anyone who approached their mound. The Little People so terrified the local population, Lewis reported, that the Maha (Omaha), Ottoes (Otoe), and Sioux would not go near the place. The Lakota people who came to live near the “Spirit Mound” after the Wičhíyena Sioux have a story no more than 250 years old which describes how a band of 350 warriors came near the mound late at night and were nearly wiped out by the ferocious Little People (the survivors were crippled for life). If this story is found to be true; it implies that the “Stick Indians” were very well capable of making proper tools. The story in question reminds me of the Sentinel islanders in the Andaman islands. Sentinel island is situated directly west of Great Andaman island and north west of Little Andaman island (Little Andaman is where the Onge Negrito live). The Sentinelese islanders have always fended off outsiders by shooting arrows (and throwing spears). There even was a case in 2006; where Sentinelese islanders killed two fishermen. That’s a thousand miles to the east. Around here they are not quite so fierce more like leprechauns than ‘devils’. They mostly throw rocks if they are angry and then from behind. The people I have talked to who have encountered them (yes it still happens) report being struck with something like a small pebble or such usually in the ankle region or back of the lower leg. I suspect it is stories about an earlier population that were mostly coastal gatherers that lived in small bands. You are right about the Little People (LP) the Wičhíyena Sioux are referring to is 1000 miles to the east. That doesn’t mean the LP (Stick Indians) on the westcoast aren’t related to the LP inland to the east. If the natives can migrate 1000 miles inland; why can’t a Negrito-like people do the same? Than there’s the difference between the westcoast LP and the inland LP. Just like modern humans there are some who are peaceful and there are some who are warlike. The westcoast (western) LP can be considered peaceful and the inland (eastern) LP can be considred warlike. The first three Negrito tribes are peaceful and live side by side with the newcomers which are the Indians (mainland south asians). The latter fourth Negrito tribe ‘Sentinelese’ is warlike. I’m not sure that describing the Sentinelese as “warlike” is very accurate. I don’t believe that they raid any of the other people in the Andaman Islands and I don’t think much is known about whether there is a lot of internal conflict on the island. They kill outsiders who venture too close but this is a very wise precaution on their part considering how vulnerable they probably are to contact with outsiders and all their diseases. Very true. If there was a Melanesian/ Australoid population there is no reason at all to assume they were all alike anymore than all the tribes were alike when Columbus sailed the ocean blue. Here is an interesting story and video I found recently which you (who are interested) can have a look at. The video was posted well before the recent DNA research as it states ‘March 28, 2009’. Either you can watch the full video or skip to the 6:45 min mark. It’s a story about an Inuit (Alaskan) named ‘Grey Wolf’ who seemingly sailed (paddled) a selfmade sea-(ocean-)going Kayak during the mid 1930’s from southern Alaska to New Zealand (NZ). The placename ‘Grey Wolf’ arrived at in NZ is almost unintelligible. It sounds like ‘Hope younger’ which I find strange so I figured it should sound like Hopi or Hoki. I have searched for a placename in NZ and sure enough I found a match ‘Hokianga (Harbour)’. Hokianga is on the west of North Island NZ; north of Auckland, south of Kaitaia and west of Kaikohe. The recent research data does indicate an Oceanic genetic link to Aleutian Islanders; Aleut islands are south west of Alaska where the Inuit live. Did the Inuit (Shaman) in question had advanged ‘ancient’ knowledge on which way to sail (paddle) to or was it coincedince?